Each year, admission representatives from Jesuit colleges and universities travel in groups to visit high schools, as part of the Jesuit Excellence Tour. And each year, Prep hosts a JET visit. But this year, thanks to the efforts of Prep’s guidance and college counseling department, the event had a new look and a much higher profile. 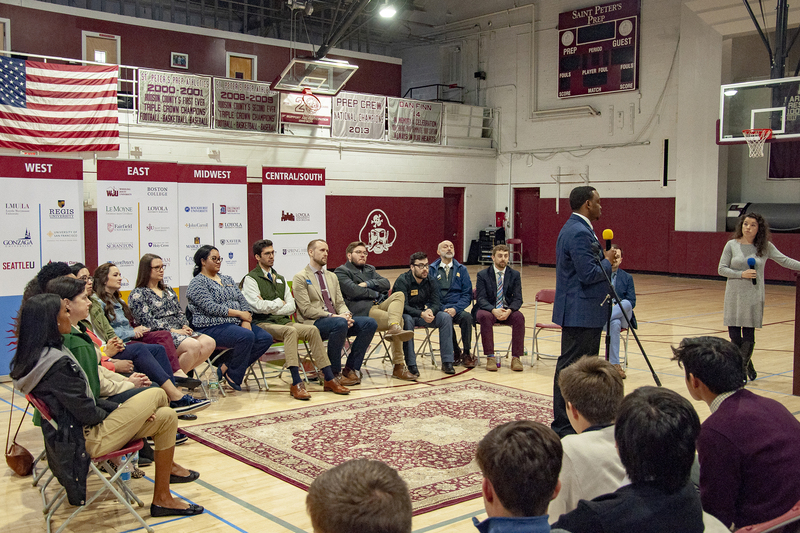 Rather than simply setting up tables in the lobby, the 16 representatives on hand Tuesday joined the sophomore and junior classes for an assembly. This provided an opportunity for an introduction and overview, as well as some discussion of what Jesuit higher education has to offer. Ms. Sarah Morissette of the guidance and college counseling department led the panel, which covered topics including academic programming, special opportunities for Jesuit high school alumni, and campus life. Following the assembly, the representatives moved to tables in the courtyard for a more traditional college fair, making themselves available for individual conversation with interested students.